தொலைக்காட்சி விளம்பரம் – செலவு எவ்வளவு? யம்மாடியோவ்!! இன்னிக்கு நிலமையில் இம்புட்டு செலவா? 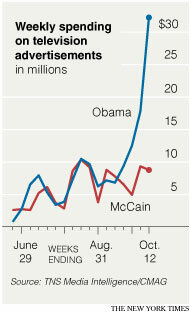 Obama by the Numbers – The Caucus Blog – NYTimes.com: Just counting donations of $200 or more, the Obama took in from $1 million to $7 million on all but four days in September. * spent $5 million to move himself and his employees around. * His payroll expenses that month came to $3 million. * print and on-line advertising ($3.3 million). * those pesky credit card fees ate up some $1.2 million.